In a medium bowl combine chicken, sherry, soy sauce, honey, sesame oil and cornstarch. Mix everything with your fingers. Refrigerate and let it marinade for 30 minutes. In a large skillet over medium high heat, add olive oil and chicken. Brown chicken, about 4-5 minutes. Using a slotted spoon, transfer chicken to a clean bowl and set aside. In the same skillet over medium heat, drizzle some olive oil and add asparagus and garlic. Season with salt and pepper and sauté for about 5 minutes. Add chicken back into the skillet and continue to cook for about 1-2 minutes. Remove from heat and check for seasoning. Serve this over rice and garnish with chopped scallions if desired. Mmmm! This looks super-delicious. Thanks for sharing! Can’t wait to try it. I too enjoy a good stir-fry! This looks super duper tasty. You’ve reading my mind Anne, just got a gently used wok at Goodwill last week (don’t even have to season it) and have been researching recipes to try out! I’m not an asparagus person but with stir fry there are so many other veggies to substitute. Looks great! Simple and delicious. My kind of meal. Haha! Will have to cook for you when you and Shawn are free! HUGS sweetie! Getting spattered is the worst, ow ow ow! Mmmm, it’s lunch time here and now I am really hungry. This looks yummy! I love stove top recipes for the summer. I’ve never tried sherry in stir fry before, curious to give that a try. 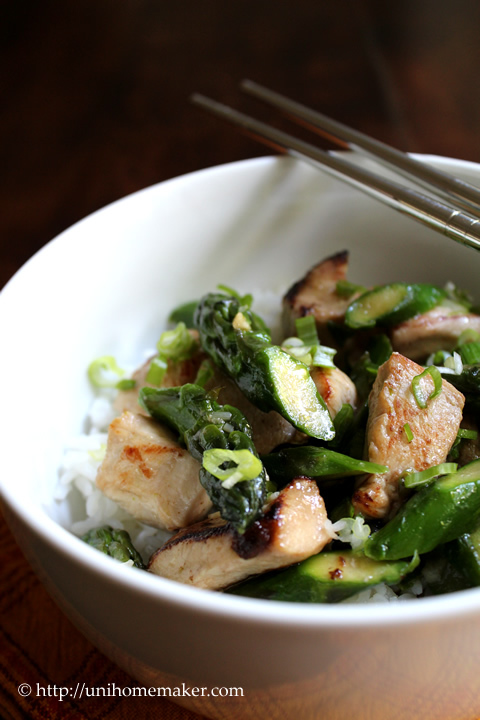 I love a good stir-fry, too, and this one looks perfect. Love the asparagus, too! I’m with you on not wanting to wash extra dishes for the spattering. I love this recipe…and how your pics always just jump right out! I’m now very hungry! You’re so sweet Gloria! 🙂 Thank you for the lovely comment. I love my vegetables cooked rather than raw too – and even with the splatter, the whole time-efficiency of stir-frying just makes sense! Fabulously fresh and delicious….I can tell. I do stirfries practically every single night! Love how beautiful yours look. Especially asparagus spears. I LOVE making stir fry at home, too! Looks wonderful! Haha, you’re too funny! 🙂 Thanks for taking the time to comment John. How yummy! 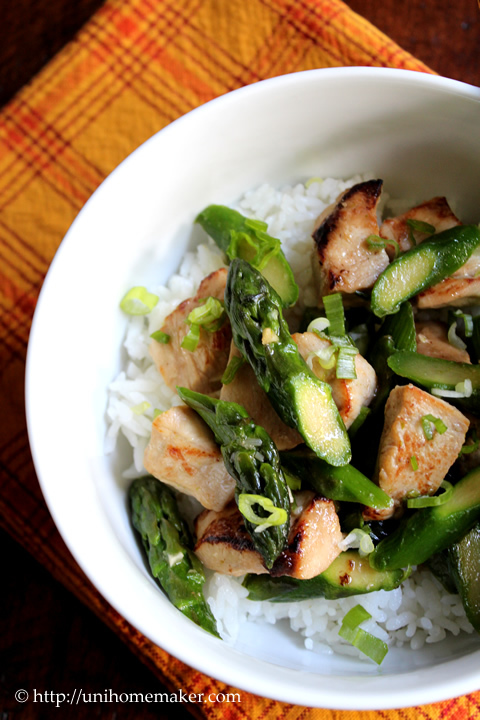 Love stir-fry but never thought of adding asparagus! Looks delicious Anne! Can’t wait to test out the recipe. Thanks Claire! 🙂 Always lovely to hear from you. Hope all is well! I love this recipe Anne, it may just be the “kick” I need to dig out that Wok! I think it’s time we had a stir-fry at our house. Looks good! I love stir fry’s. I don’t make them often because I usually use lots of different veggies which require different cooking time. 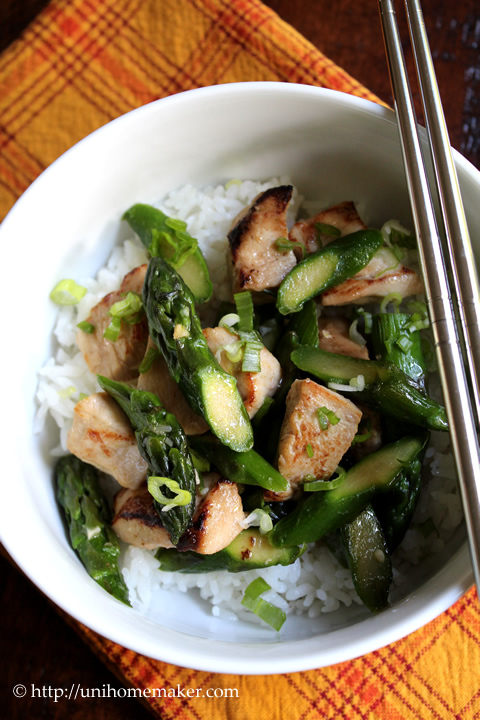 This asparagus and chicken stir-fry looks so inspiring and simple, it’s perfect for the summer or a quick fry! Thanks Anne. What a fantastic combination! This sounds yummy! This looks so very delicious, Anne! I love light, easy meals like this in the summer! Quick and delicious!!! I’d love this for dinner…and soon!!! Such a nice summer meal – so light and delicious! A reminder my poor wok has not had any attention lately! Have a great Thursday Anne! Those splatter guards do work, mostly, but I’m with you on not want to wash them. Great looking dish! I haven’t made a stir-fry for quite awhile and definitely need to again. Thanks so much. This looks wonderful, Anne! I love love LOVE asparagus. Pinned! This stir fry looks so yummy and the presentation is very stylish. I love a good stir fry and this is no exception ! Your comments are always so lovely Bobbi –thank you! I always love to hear from you. Hope you are doing well. My family loves asparagus, totally trying this soon!! Thanks for stopping by Aimee! I’m with you on the spattering. I can’t tell you how many shirts have been spattered with oil… even when I wear a full apron! 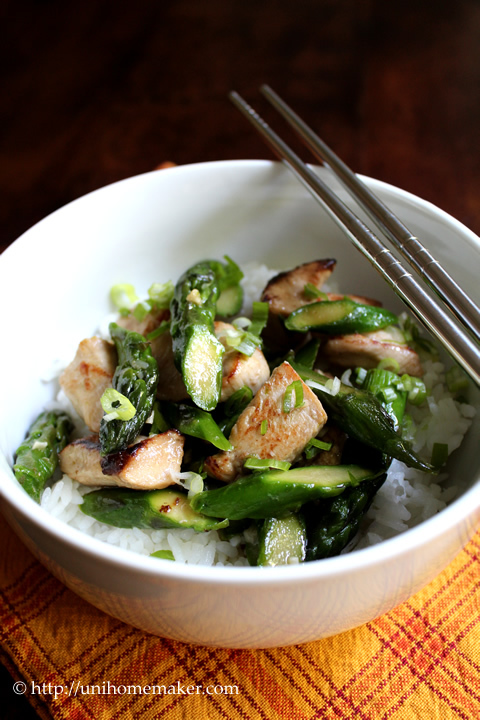 My husband and I just began enjoying asparagus, so I know we’d like this stir fry. Thanks for sharing! Yikes! Those are the scary spatters. Thanks for taking the time to comment Eva. OK yum – this looks so delicious!! Hi Lisa, I’m so happy to hear you enjoyed this dish. As for the nutritional information, unfortunately I don’t keep track of that. I purposely used white meat to keep the fat content down. I do hope you’ll come back and visit my site again. Cheers!